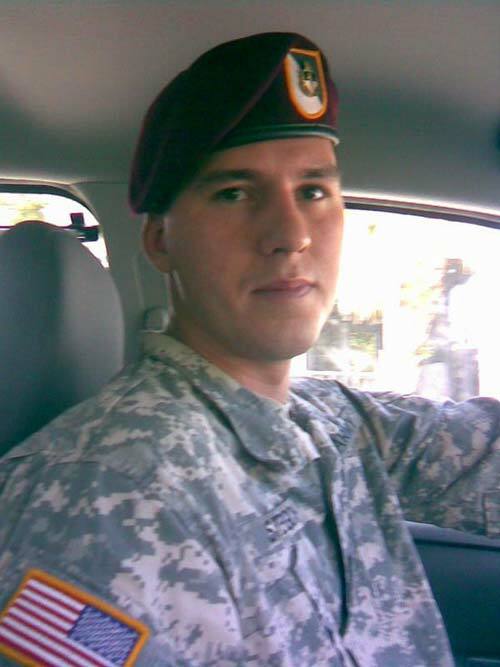 If you are considering hiring or otherwise becoming entangled with this person, you might want to read this story about the circumstances surrounding his Army discharge. Documentation is provide throughout. Much to my embarrassment and disgust, Ruben Stegich is my nephew, my sister's oldest son. In Aug of 2010, he returned from a deployment to Afghanistan, 4 years into a 5 year stint in the US Army (originally 4 years, he signed up for an extra year.) I heard he was planning on getting out, but couldn't figure out how. On Dec 23, 2010 I was talking to his wife, who was on the phone while in the commissary with their 2 children. His wife asked me, "You know how he's getting out don';t you?" I said, "No, I was wondering how he was managing to get out of the contract I thought he still had nearly a year or so left." She replied, "He does but, he's applying for a hardship discharge on the basis of having no one to care for the children." To say I was astonished would be an understatement, here she was taking care of the children and still living in their jointly owned home. I told her, "You know that is illegal, lying to get out of the military?" She then replies, "It's the only way to save his life so the children will have their father in their lives." "What are you talking about, " I asked. "Ruben says he's had a dream where if he is deployed again, he will die. I don't want my children to grow up without their father," she responded, becoming more emotional. It was then that I learned that she had signed (after weeks of coercion, witnessed by other family members) a custody agreement drafted by Ruben and his lawyer giving Ruben the children as a way to bolster his claim that he had no one to take care of the children if he were to deployed. "He told me it's just a piece of paper to allow him to get out of the military and that we'll' share custody." At this point I continued to insist to her that this was illegal and a bad way to go as she grew increasing upset with me over my stance in this situation. That night was a sleepless one for me, torn between a family member and doing what I knew was right. My favorite grandfather had served honorably in both WWI and WWII (and was at Pearl Harbor on Dec 7, 1941.) My great-grandfather had been a detective with the Syracuse Police Department. Doing what is right had been drilled into me from an early age. The additional thought crossed my mind that by telling me in advance what they were planning, they had made me an accomplice before the fact. By the next morning I had come to a decision, I had to turn him into the military for his attempted fraud. I called his wife, I felt it only right to let her know that I had turned them in to the Defense Department Fraud Line. I had hoped they would stop this course of action. She did not take it well, getting extremely upset with me. It was the last phone call we had for a while, she cut off contact. That was until mid February 2011, when she called and apologized for her reaction. In the meantime a number of events had occurred, Ruben kicked her out of their jointly owned home on Dec 29, 2010 with the assistance of his brother, mother (my sister) and her husband. His wife was by herself, not knowing her rights and unable to stand alone against this group. 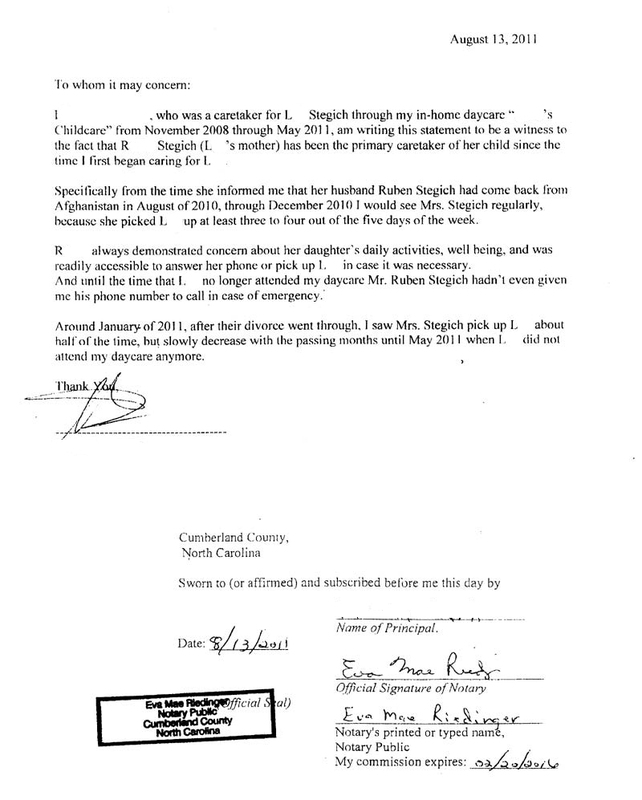 On Jan 5, 2011 Ruben sends an e-mail to his wife and signs a statement at Fayetteville Technical Community College (FTCC) attesting to the fact that the children live with their mother full time. On Jan 31, 2011, Ruben is discharged from the US Army. Apparently the Defense Department did not look into this and his hardship application went through. 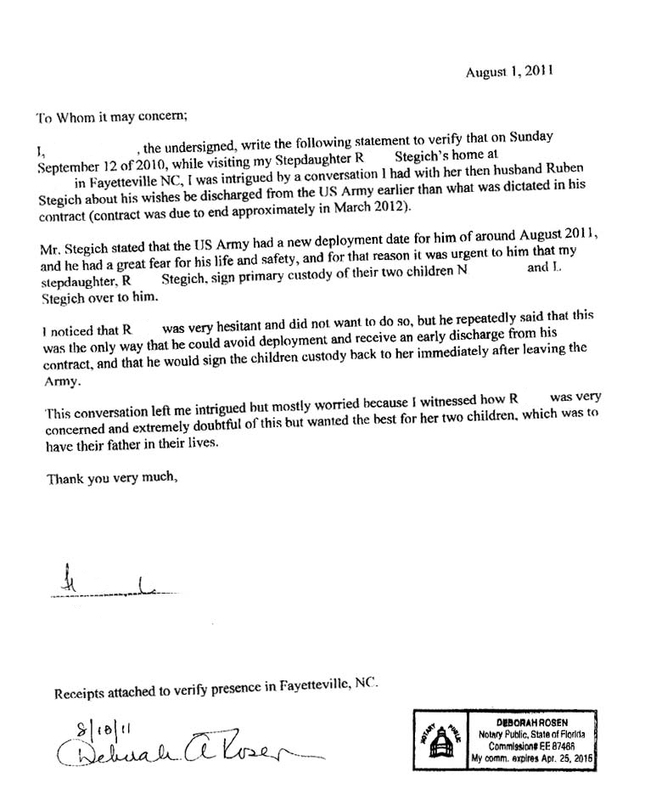 Approximately 2 weeks after his discharge, Ruben informed his ex-wife that he intended to enforce the custody agreement she had signed to help him, reneging on his verbal assurances to her that it was "just a piece of paper to allow him to get out of the military and that we'll' share custody. It was then that she realized that she too had been conned. At that point, she realized she needed help to get her children back and called me. I helped her find a lawyer. I also helped her prep the case. 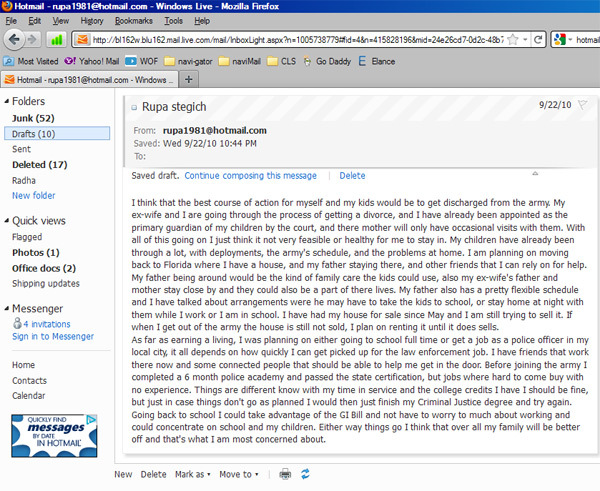 In the process of preparing evidence for her custody case, we came across a draft e-mail Ruben had written on Sept 22, 2010 to an unknown person or persons where he makes his case for a hardship discharge. See e-mail draft. Other evidence in the form of notarized statements from other family members (1 , 2) attesting to the fraud and coercion to get Ruben's wife to sign the Custody by Consent were obtained. The daycare worker who watched their daughter also signed a statement attesting to the wife being primary caregiver and daycare contact until May 2011. 1. "That the Defendant (wife) alleged that she executed this Consent Judgment in order to help her spouse be discharged from the military." Consent Judgment is the custody agreement. 2. "That the parties continued to live in the same residence occupying separate portions thereof until the 28th of December, 2010, when the Plaintiff (husband) forced the Defendant (wife) from the residence." 3. "That the Defendant (wife) acknowledged that the purpose of the Judgment by Consent was to enable her husband" (Ruben) "to leave the military and avoid redeployment, which he subsequently did." 4. "That the Defendant (wife) assisted the husband in this alleged scheme and therefore agreed to same." Something that she sorely regrets to this day, but that she has owned up to and did not for any monetary gain (she got nothing from the divorce) but in an effort, however misguided, to allow her children to have their father alive. If you are with a verifiable law enforcement agency (and I will check you out to confirm) seeking preemployment information or seeking to prosecute Ruben Stegich for fraud, I will FAX you the un-redacted documentation upon submission of a request form.